The Angus Tait Memorial Hexhamshire Hobble ("the Hobble") is an annual fell race of about 10 miles across Hexhamshire Common. Registration: Allendale Primary School Sports Hall from 9:30am. Finish: Allendale Primary School field. Conditions can be severe on the fells, particularly this time of year. The organisers reserve the right to cancel the race in the event of exceptionally inclement weather which could prejudice the safety of the competitors. Parking: Ample parking at Allendale Primary School and in the Village. FRA safety conditions will apply. Over 18 only. All competitors must carry whistle, compass and map suitable for navigating the course (OS 1:25,000 Explorer OL43 or 1:50,000 Landranger 87), full body waterproof cover and emergency food. MP3 players, ipods and the like are strictly forbidden and will result in immediate removal from the race and disqualification. Kit checks will be carried out. Failure to comply with kit can result in disqualification and a ban from FRA permitted races. Competitors must be prepared to accept these requirements as a condition of race entry. No dogs allowed. NB: The 2018 Hobble will be run clockwise. 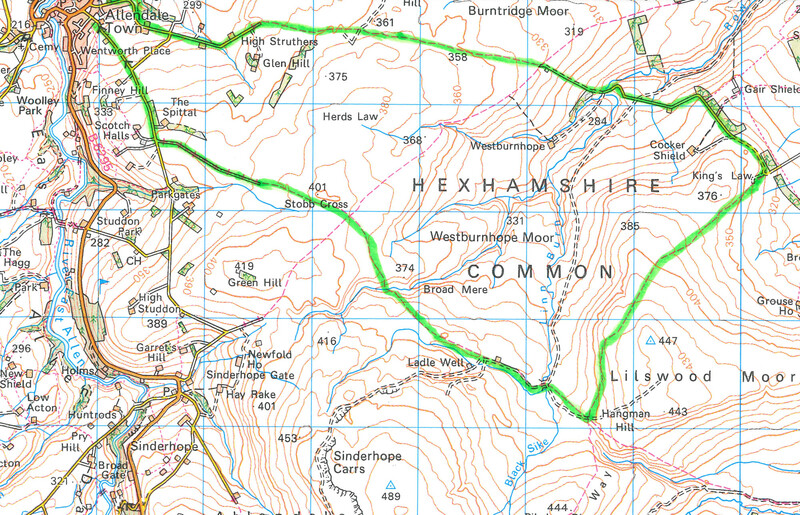 NB: In the profile below corresponds left-to-right corresponds to the anticlockwise route.